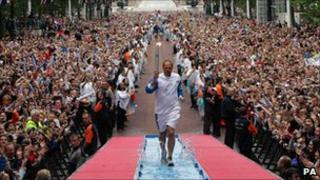 The Olympic flame will stop off twice in Cumbria during the torch relay leading up to the 2012 London Games. Thousands of torchbearers are being recruited for the flame's 70-day journey across the UK before the opening ceremony in London. The dates and locations for the evening stop-offs have now been announced and include Carlisle on 20 June and Bowness-on-Windermere on 21 June. The flame will be greeted with evenings of celebrations at both locations. Carlisle City Council leader Councillor Mike Mitchelson said it was fantastic news coming off the back of Radio 1's Big Weekend being held in Carlisle and the focus that had brought to the city. He said: "We're delighted that our bid to be part of the London 2012 Olympic torch relay route has been successful and that we'll be welcoming the Olympic flame to Carlisle. "It's a chance for our communities to get involved in the build up to the Olympics and take part in a local evening celebration. "It will also provide another boost to our local economy, as well as promoting the city and its key attractions to a global audience." He said the aim would be to get as many people as possible involved. Carlisle and Bowness-on-Windermere are two of the first 74 locations announced. More details about the route will be unveiled later this year. South Lakeland District Council leader and Cumbria 2012 chairman Councillor Brendan Jameson said it was wonderful news. He said: "I firmly believe that it will be the biggest opportunity that Cumbria will ever have to market itself on the world stage. "The Olympic Games isn't just about London, it isn't just about the United Kingdom, it's a world festival." The Olympic flame will arrive in the UK from Greece on 18 May 2012 and the torch relay will start at Land's End the following day. It is estimated it will be carried 8,000 miles before arriving at the Olympic Stadium on 27 July. London Organising Committee of the Olympic and Paralympic Games chairman Sebastian Coe said: "The Olympic flame will shine a light right across every nation and region of the UK and showcase the very best of who we are and where we live."